Coleslaw? French people don't eat much coleslaw and that's a shame! Really! We do it a lot (I mean A LOT) of shredded carrots and shredded red cabbage salads but somehow we did not come to coleslaw until fairly recently. I had it maybe twice before coming to the US and realizing that it is a favorite side dish everywhere in the country. But why make coleslaw when you can purchase it already prepared at the deli counter in the local supermarkets? I'll give you a few reasons: 1) It's fresh. 2)You control the ingredients (less or more cabbage, what about a few radishes or parsnips, more carrots, an apple?). 3)It's very easy to make. 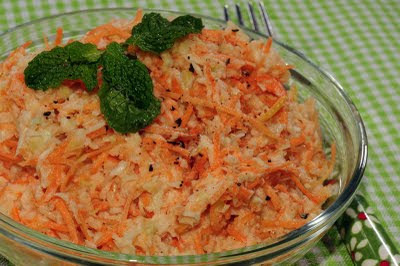 4)Your kids will be delighted to see how a whole carrot ends up shredded. 5)You'll have made something "from scratch" that everybody loves in your family! The other day, we had bought a large green cabbage at the Farmers' market and we ate half of it in the Potée Lorraine but the other half was sitting in the fridge. Every time I opened the fridge (and that's many times a day), I would look at it, scratch the back of my head, trying to come up with an idea. Until my husband came back one day and said (I don't know why), "I love coleslaw". Great! We'll make coleslaw. It's so easy! Me being me, I could not just settle on the "mayo + mustard" sauce so I went online and looked for other acceptable dressings. I could not use peanut butter because of my little ones but I had a jar of Tahini (sesame paste) that I had bought one day and did not really know how to use... so I came up with the Tahini+ Sesame seeds+ Fresh cilantro dressing. And you know what? My 4-year-old liked it better than the traditional coleslaw dressing. And since that day, we eat coleslaw whenever a cabbage enters our home... and Fall being Fall, it's pretty much every week! Bon Appétit! You can find Tahini in every supermarket these days; it's generally next to the peanut butter. If you can not shred the vegetables, slice them very thin. I prefer my coleslaw very thinly shredded. It also works better with little ones. If you made too much, don't add the dressing to the whole dish; just season what you are going to eat. You can serve the rest the following day but it does not keep very well. You could try to make your own mayonnaise. My dad used to make it but I have not tried it in years. I bought Mayonnaise made with Olive Oil for the coleslaw; it looked healthier than the regular mayonnaise. Cole slaw is also very popular in Ireland. I have tries the deli version and the home made version. No doubt that the home made version is a winner.